Most racing fans aren’t huge fans of the aesthetics of the halo—Formula One’s new cockpit protection device which envelopes a driver’s upper body in a big flip-flop-looking thing. But they’re so here for the classic livery of Williams’ main sponsor Martini. Friends, this is what I call a missed opportunity. 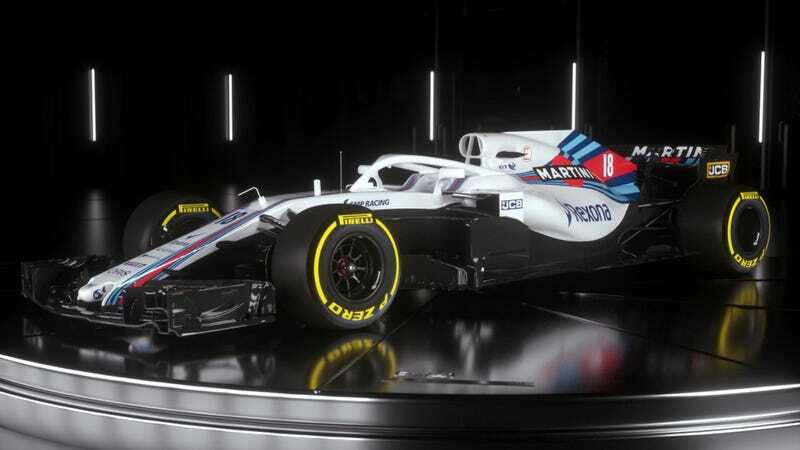 The new 2018 Williams FW41 car revealed today is a fine enough car wearing a classic Martini livery, albeit with more black around the bottom of the car this year. Sure enough, that controversial looking halo sticks right out in white. I’m talking, of course, about Martini striping the halo. Just cover it with every racing fan’s favorite stripes on the outside. After all, there’s nothing That Guy who yammers on about how things “used to be” loves more than a classic livery. Under everyone’s favorite stripes, however, is a car Williams says has significantly revised aerodynamics compared to last year’s FW40. Technical expert Craig Scarborough tweeted out the highlight reel, which includes bargeboard and front wing details, the outlet on the front for the S-Duct (which takes air in from under the car and ejects it through the top to increase the airflow efficiency of the car’s front end) next to the front suspension, and the newly mandated smaller shark fin. Lance Stroll will return to drive the car alongside new driver Sergey Sirotkin, but the more interesting story may be with their new reserve driver: Robert Kubica. Kubica nearly died in a 2011 rally crash that severed his right arm, forcing him out of racing for several years. It took six years before Kubica returned to drive an F1 car in 2017, when he was still quick in tests. Many fans who thought Kubica would be one of the greats earlier in his career hope this Williams role is the first step in his return to competing in F1 full-time. Either way, it’s a pretty incredible comeback to see him land in that role.